Elliot Goblet is a character created by the Australian comedian Jack Levi. Elliot Goblet is one of Australia's most original comedy characters and he is renowned for his deadpan delivery of classic one-liners - his style can draw comparisons with that of the American comic Steven Wright. He started out with round glasses and a goatee beard but later removed the beard. Created with assistance from Australian comedy guru Pete Crofts, the Goblet character launched into the comedy scene with numerous TV performances on Hey Hey It's Saturday, The Eleventh Hour, Statesmen of Comedy and many other Australian TV variety and sketch shows. He recorded an ARIA award nominated CD Internally Berserk, wrote a bestselling book Business According To Goblet and appeared in short films and also the feature film Fat Pizza: The Movie. A real highlight of Elliot Goblet's career was the hosting of the Qantas comedy audio program on all Qantas flights worldwide. 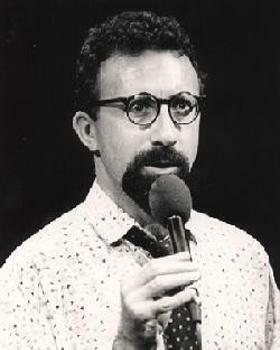 Levi as Elliot Goblet has done live appearances all over Australia as well as in seven other countries including The United States and United Kingdom. Currently, apart from doing the odd public performance or wedding, most of his work is at corporate events as a performer or MC. Together with Mitchell Faircloth (aka Slim Whittle) he created The Crimson Goat Cabaret Club.